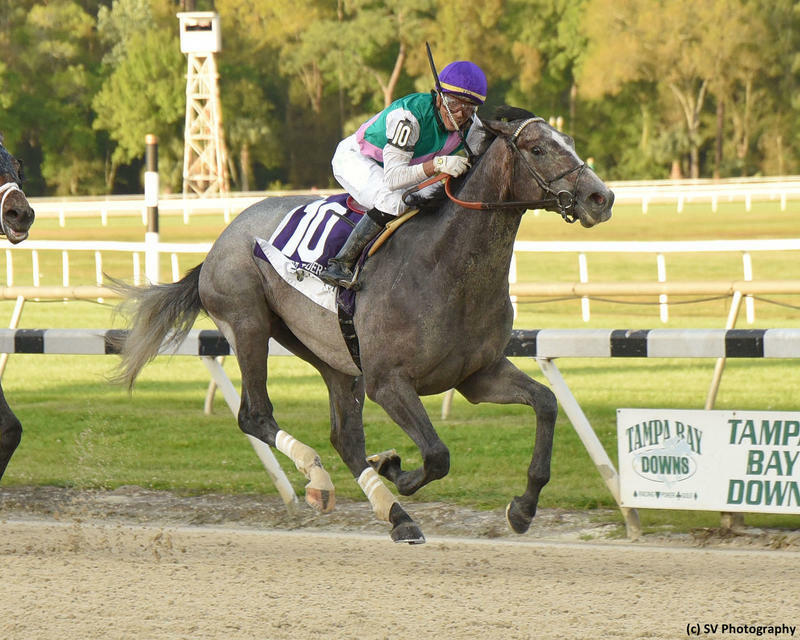 Last seen breaking his maiden in mid-November, Tacitus rallied boldly up the inside to win Saturday’s $350,000 Tampa Bay Derby (G2) and likely guaranteed himself a Kentucky Derby berth in his stakes debut. The up-and-coming colt finished fast to establish a new stakes record, completing the 1 1/16-mile race in 1:41.90, and Jose Ortiz had the mount for Bill Mott. The gray son of Tapit left the starting gate as the 8-1 fifth choice in the 11-horse field. Owned and bred by Juddmonte Farms, Tacitus earned 50 points capturing the Road to the Kentucky Derby series qualifier. He’s the first foal out of 2014 champion older female Close Hatches, an earner of more than $2.7 million. Tacitus dropped off the pace after breaking from post 10 and Zenden sped forward to show the way on a clear lead, carving out fast fractions in :22.79, :45.85 and 1:09.57. Sam F. Davis (G3) upsetter Well Defined chased the pace in second and Outshine stalked in third. After making headway on the far turn, Tacitus launched his bid in the stretch. He negotiated his way through traffic and displayed terrific acceleration to blow past his rivals and win going away by 1 1/4 lengths. Fourth when making his career debut at Belmont Park in early October, Tacitus broke his maiden by a neck at Aqueduct in his second outing. He’s now earned $253,000. “We've always liked this horse and thought he could be a horse that would be on the (Kentucky) Derby trail,” Mott said. “I liked him a lot better today at the three-eighths pole than I did at the five-eighths pole, because it looked like when he was trying to get between horses, I couldn't tell if he was maybe fighting with the racetrack. Outshine, who was exiting an allowance win at Gulfstream Park for Todd Pletcher, finished second at 6-1. It was another 1 1/4 lengths to 7-5 favorite Win Win Win, who came up a little short with his late rally. Zenden saved fourth and was followed under the wire by Sir Winston, Dunph, Admire, Well Defined, The Right Path, Dream Maker and Lord Dragon. Tacitus promises to bring a formidable closing kick to his final Kentucky Derby prep race.